Jimmy Kimmel and Warren Beatty laugh after correcting the Best Picture Oscar from La La Land to Moonlight. 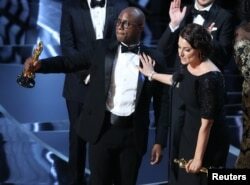 Barry Jenkins' "Moonlight'' - not, as it turned out, "La La Land'' - won best picture at the Academy Awards in a historic Oscar upset and an unprecedented fiasco that saw one winner swapped for another while the "La La Land'' producers were in mid-speech. Presenters Warren Beatty and Faye Dunaway apparently took the wrong envelope - the one for best actress winner Emma Stone - onto the stage. When they realized the mistake, representatives for ballot tabulators Price Waterhouse Coopers raced onstage to stop the acceptance speech. Director Barry Jenkins and producer Adele Romanski celebrating the best picture win for "Moonlight." It was, nevertheless, a shocking upset considering that "La La Land'' came in with 14 nominations, a record that tied it with "Titanic'' and "All About Eve.'' Barry Jenkins' tender, bathed-in-blue coming-of-age drama, made for just $1.5 million, is an unusually small Oscar winner. Having made just over $22 million as of Sunday at the box office, it's one of the lowest grossing best-picture winners ever. "Even in my dreams this cannot be true,'' said an astonished Jenkins, once he reached the stage. Producer Jordan Horwitz then graciously passed his statue to the "Moonlight'' producers. 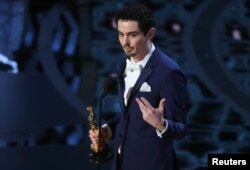 Damien Chazelle accepts the award for winning Best Director. Damien Chazelle's celebrated musical "La La Land,'' up for a record-tying 14 nominations, took a while to start cleaning up. But as the night went on, its haul began piling up, winning for cinematography, production, score, song "City of Stars'' and best actress for Emma Stone. Chazelle, the 32-year-old filmmaker, also became the youngest to win best director. "This was a movie about love and I was luckily enough to fall in love while making it,'' said Chazelle, speaking about his girlfriend and Oscars date, Olivia Hamilton. Barry Jenkins, the writer-director of "Moonlight'' and Tarell Alvin McCraney, whose play it was based on, won for adapted screenplay. "All you people out there who feel like there isn't a mirror out there for you, the academy has your back, the ACLU has your back and for the next four years we will not leave you alone, we will not forget you,'' said Jenkins. Casey Affleck speaks as he accepts the Oscar for Best Actor for "Manchester by the Sea." Shortly later, Affleck - in one of the night's most closely watched categories, Affleck won best actor - his first Oscar - for his soulful, grief-filled performance in "Manchester by the Sea.'' Affleck and Denzel Washington ("Fences'') were seen as neck-and-neck in the category. 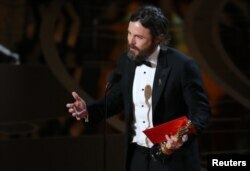 An admittedly "dumbfounded'' Affleck looked shocked when his name was read. "Man I wish I had something bigger and more meaningful to say,'' said Affleck, who hugged his more famous brother, Ben, before taking the stage. Oscar® Nominee, Justin Timberlake, performs at The 89th Oscars® at the Dolby® Theatre in Hollywood, CA on Feb. 26, 2017. 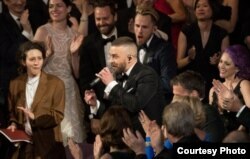 The show kicked off with Justin Timberlake dancing down the Dolby Theatre aisles, singing his ebullient song, "Can't Stop the Feeling,'' from the animated film "Trolls.'' 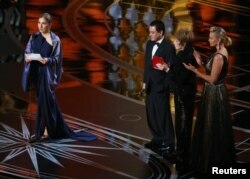 It was an early cue that the Oscars would steer, at least in part, toward festiveness rather than heavy-handedness. Protests, boycotts and rallies have swirled ahead of Sunday night's Oscars. But host Kimmel, in his opening monologue, quickly acknowledged that he "was not that guy'' to heal a divided America. 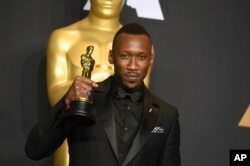 The wins for Davis, who co-starred in Denzel Washington's August Wilson adaptation "Fences,'' and Mahershala Ali, the "Moonlight'' co-star, were both widely expected. Their awards marked the first time in more than a decade that multiple Oscar acting honors went to black actors. Mahershala Ali poses in the press room with the award for best actor in a supporting role for "Moonlight" at the Oscars on Feb. 26, 2017, at the Dolby Theatre in Los Angeles. Both stuck to more private reflections over politics. But a more blunt protest came from a winner not in attendance. Best foreign film for the second time went to Asghar Farhadi, director of Iran's "A Salesman.'' Farhadi, who also won for his "A Separation,'' had said he wouldn't attend because of Trump's travel band to seven predominantly Muslim nations. Anousheh Ansari, an Iranian astronaut, read a statement from Farhadi. Best Foreign Language Film The Salesman Asghar Farhadi (Iran) is accepted by a designated woman reading Farhadi's statement. Gibson's World War II drama "Hacksaw Ridge'' was, surprisingly, the evening's first double winner, taking awards for editing and sound mixing. The bearded Gibson, for a decade a pariah in Hollywood, was seated front and center for the show, and was a frequent presence throughout. Ezra Edelman's "O.J. : Made in America'' took best documentary, making it - at 467 minutes - the longest Oscar winner ever, beating out the 1969 Best Foreign Language Film winner "War and Peace'' (431 minutes). Edelman's documentary, while it received an Oscar-qualifying theatrical release, was seen by most on ESPN as a serial, prompting some to claim its place was at the Emmys, not the Oscars. The "OscarsSoWhite'' crisis of the last two years was largely quelled this season by a richly diverse slate of nominees, thanks to films like "Moonlight,'' "Fences'' and "Hidden Figures.'' A record six black actors are nominated. For the first time ever, a person of color is nominated in each acting category. And four of the five best documentary nominees were also directed by black filmmakers. The nominees follow the efforts by Academy of Motions Pictures Arts and Sciences President Cheryl Boone Isaacs to diversify the membership of the largely white, older and male film academy. In June, the academy added 683 new members: 46 percent of them were female; 41-percent were nonwhite; and they pulled from 59 countries. "Tonight is proof that art has no borders, no single language and does not belong to a single faith,'' said Isaacs. Among the highlights of the night: host Kimmel punked a busload of tourists who were led into the auditorium with no idea they would be invading an Oscarcast in progress, creating an instant social media star out of one man who quickly became known by his hashtag, #GaryFromChicago. Kimmel interviewed the smartphone-toting tour-goers and introduced them to stars. Hands were shaken and photos were snapped. It was a charming display of goggle-eyed movie-lovers united with the stars they idolize. Also worth noting on a show that turned out to be unexpectedly fun without leaving behind a larger mission: the montage of moviegoers from all over the world citing, in their native tongues, favorite films. American films. It was a welcome reminder that Hollywood can surmount its share of walls. No matter what the best picture might turn out to be.